After 3 years operating flawlessly, the French-US satellite’s laser has failed. This contingency had been expected and CALIPSO has successfully switched to its back-up laser. CALIPSO’s laser has been probing Earth’s atmosphere tirelessly since 2006. Credits: CNES/Ill. P. Carril. “We designed the system with the ability to change to a back-up laser," said Chip Trepte, CALIPSO* project scientist at NASA's Langley Research Center. 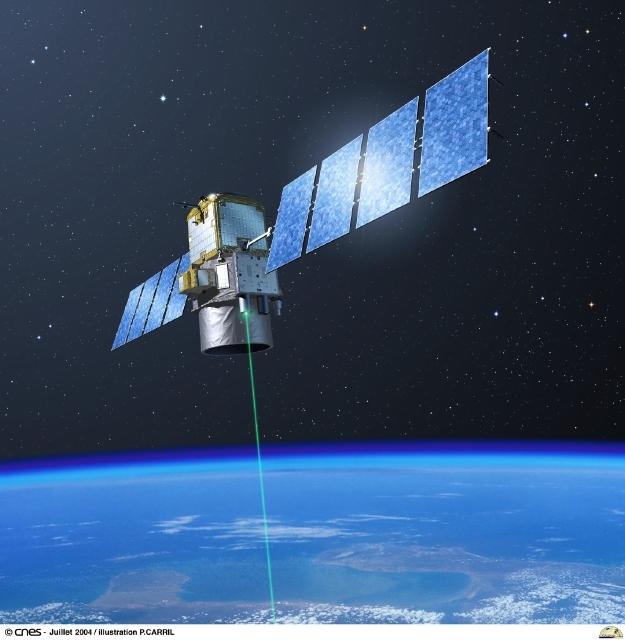 The laser is the satellite’s eye, enabling CALIPSO to obtain vertical profiles of Earth’s atmosphere. CALIPSO’s mission is to better understand the role of clouds and aerosols (suspended particles from fires, industrial activities and natural processes) in climate change. But without its laser, CALISPO is blind. “Early this year the laser started showing unstable behaviour consistent with low canister pressure,” explains Nadège Quéruel, CALIPSO mission operations manager at CNES. “We therefore decided to turn on the back-up laser.” This was an eventuality that NASA and CNES teams had been prepared for. Characteristic atmosphere profile obtained from CALIPSO data. Credits: NASA. The primary laser performed as expected but could not survive the hostile conditions of space any longer. Its back-up laser is now operational and the satellite has resumed returning its precious data since 12 March. CALIPSO is part of the A-Train constellation with 4 other satellites. Credits: NASA. The back-up laser will therefore assure continuity of CALIPSO data and the total gap in data products as a result of the transition should not exceed 10 days. CALIPSO's observations complement data recorded by the 4 other satellites flying in formation called the A-Train, which provide an unprecedented comprehensive global view of Earth’s atmospheric chemistry.